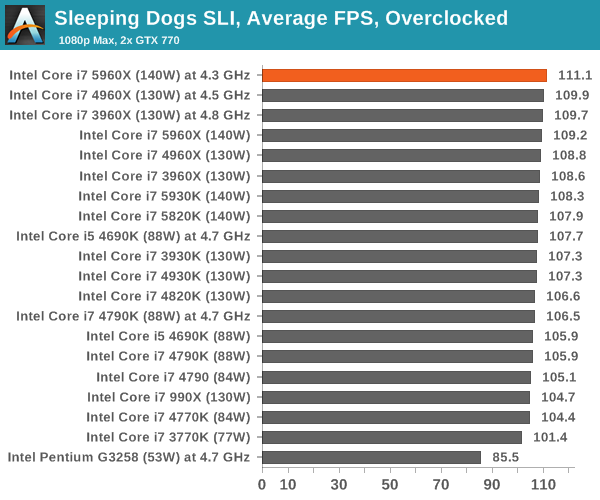 As part of our reviews here at AnandTech we have recently been including a section on overclocked results, because in the end a +10% overclock does not always mean an extra +10% on performance. 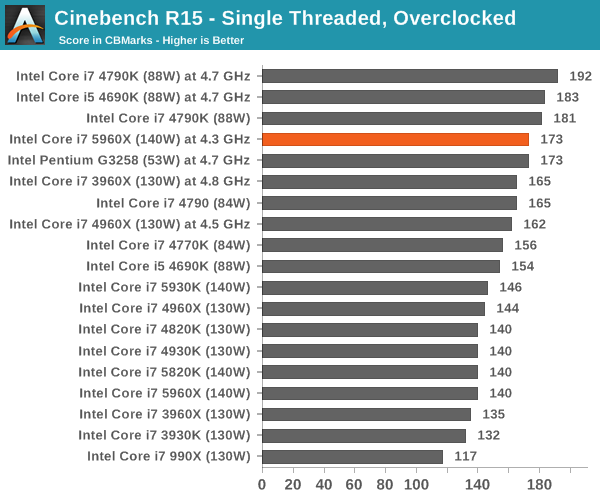 For our overclocking escapades mentioned earlier in the review, while we were able to achieve 4.6 GHz on the Core i7-5960X, the sweet spot was around 4.3 GHz at a very comfortable temperature. 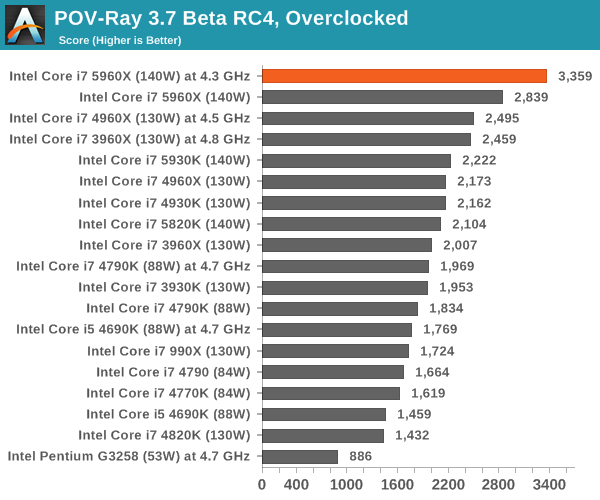 This leads to a +43% overclock over the base frequency, similar to what we saw with Sandy Bridge-E overclocking. 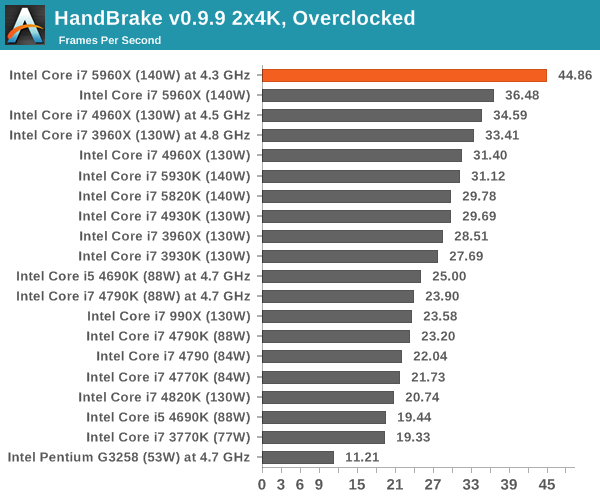 For our overclocking tests, we are using the same graphs as in the last two pages, but adding the data from our overclocked Sandy Bridge-E, Ivy Bridge-E, Haswell and Haswell-E CPUs as well, tested fresh for this review on our latest benchmark suite. 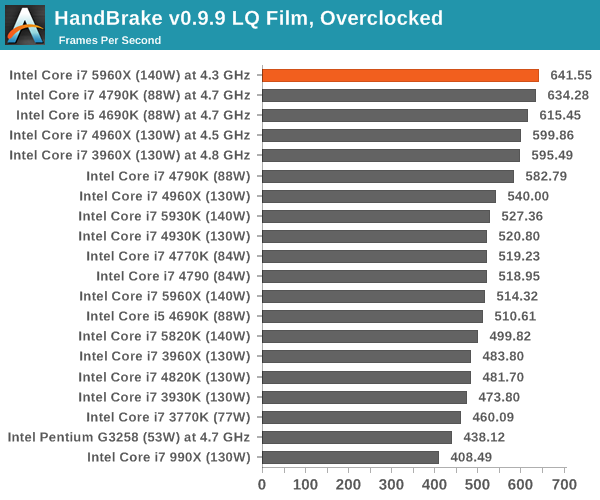 In the past overclocking was all about getting the same or better performance for a lower cost, however with Ivy Bridge-E due to its lower frequency, it was a battle to keep on par with Sandy Bridge-E. Now that Haswell-E has the same frequency deficit (200 MHz) but a +8% increase in IPC, it begs the question if Sandy Bridge-E users with good 4.8 GHz+ CPUs should consider upgrading (for anything other than more cores and an upgraded chipset). 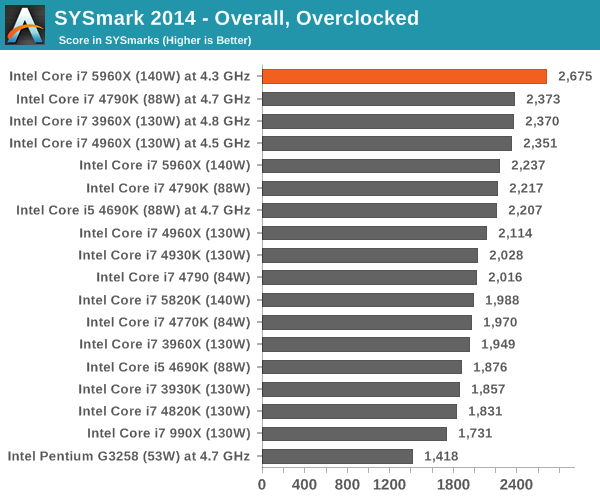 SYSmark sees the biggest uplift in its media and office benchmark suites when overclocked, although the financial suite does enjoy the more cores to put the 5960X ahead. 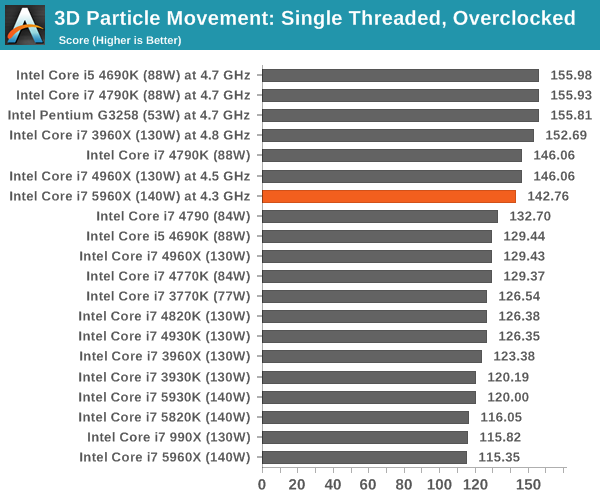 Interestingly the overclocked 5960X does aid low quality conversion, showing that with enough frequency all the cores can be constantly fed with data. 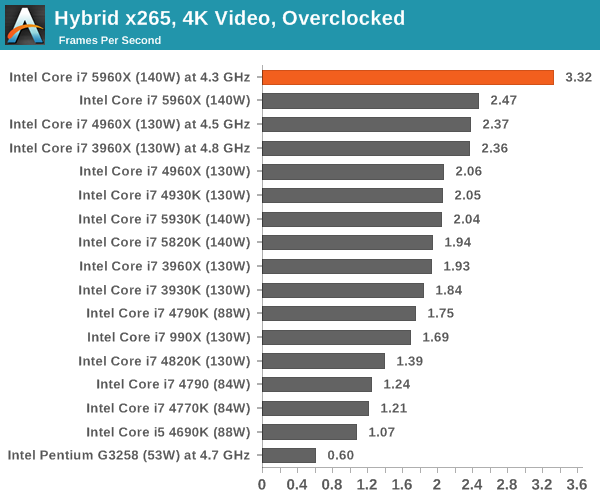 The 5960X takes the top two spots for 4K conversion. 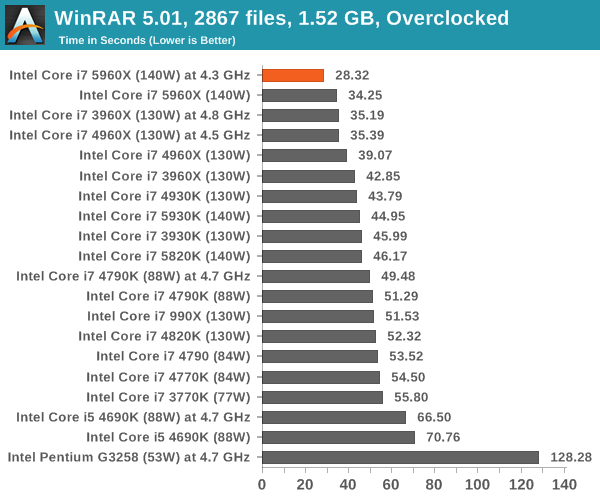 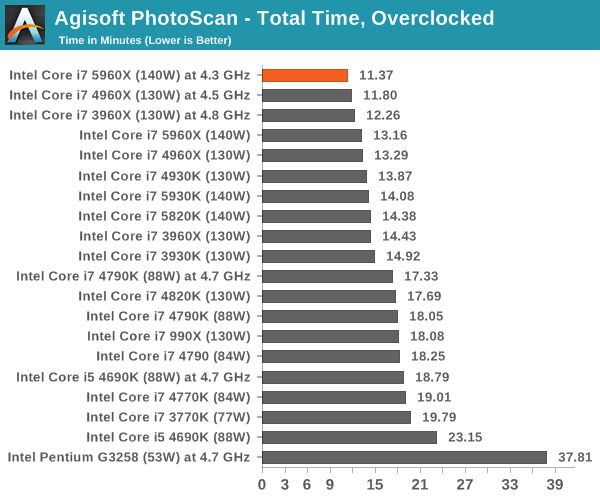 Photoscan also enjoys overclocking in combination with the cores, but the 3960X overclocked will beat the 5960X at stock despite the extra cores of the 5960X. 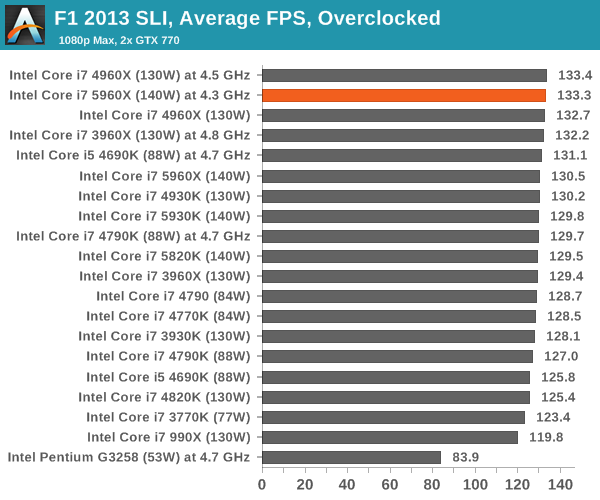 Dolphin prefers single threaded speed, so the Haswell CPUs at 4.7 GHz win here. 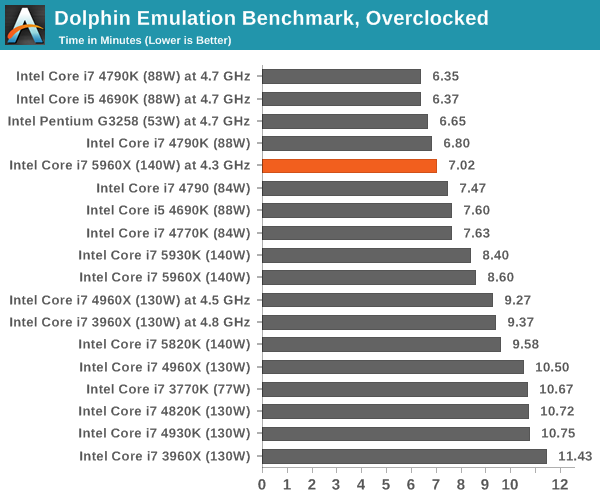 Haswell does well in Dolphin's emulation overall, hence why the older extreme processors, even when overclocked, are further down. 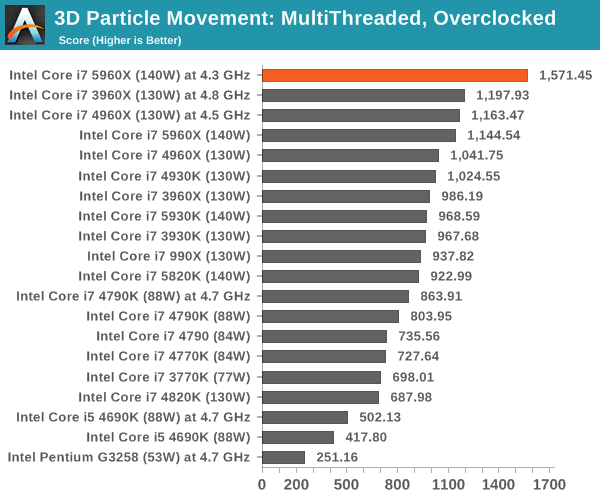 More top spots for the 5960X, with the two extra cores at stock beating the other extreme processors. 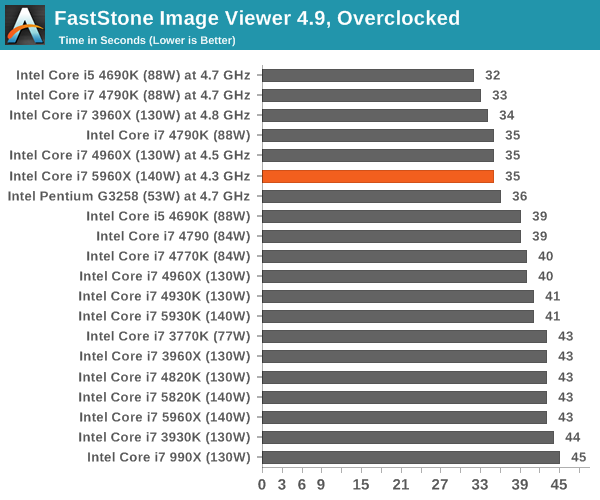 When overclocked to 4.3 GHz, the 5960X would seem to produce a similar experience in FastStone to the 4790K at stock. 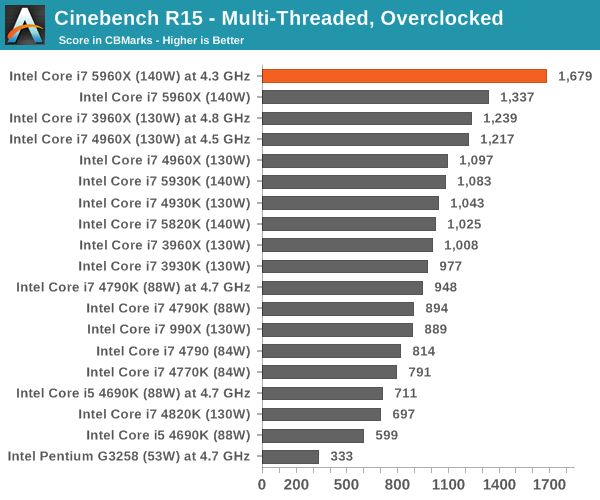 This makes sense as the 4790K at stock is 4.4 GHz in turbo mode. 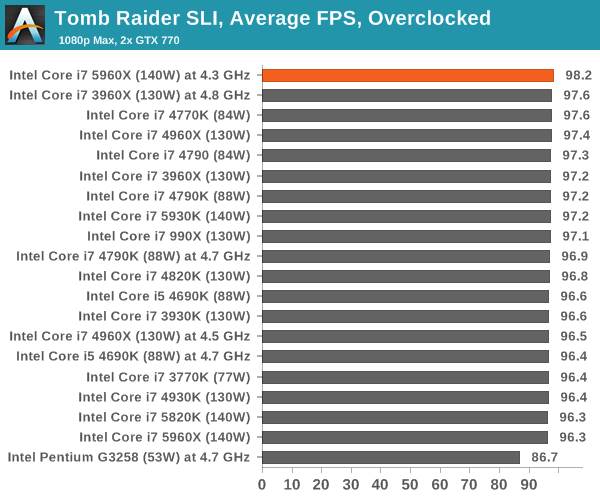 The overclocked 5960X scores a few points in minimum frame rates, giving another +20% while in SLI. 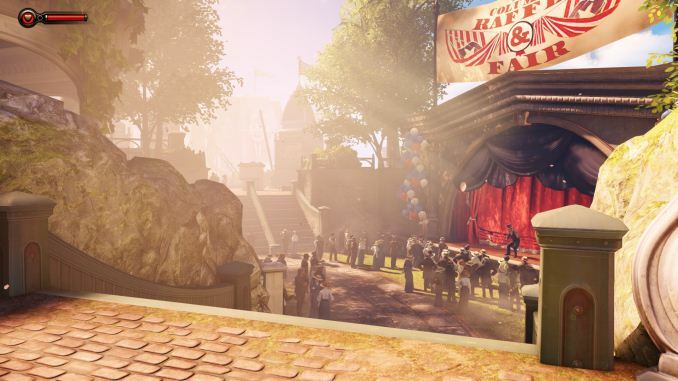 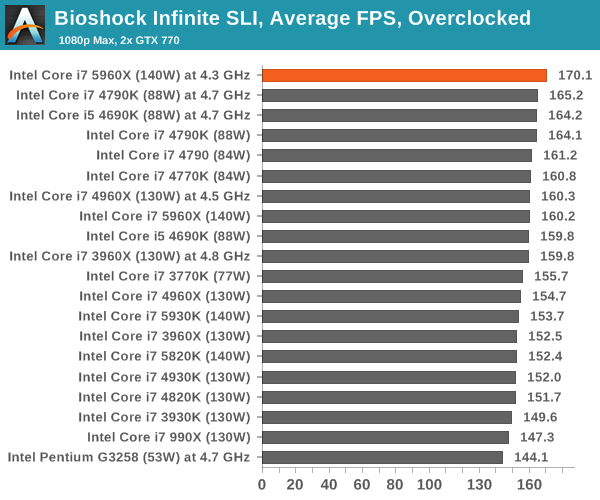 Bioshock average frame rates seem to get a small boost when overclocked, but minimum frame rates are more responsive to the 84W and 88W parts. 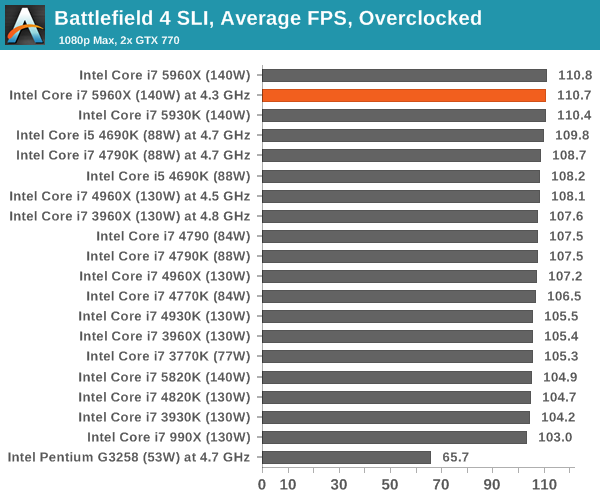 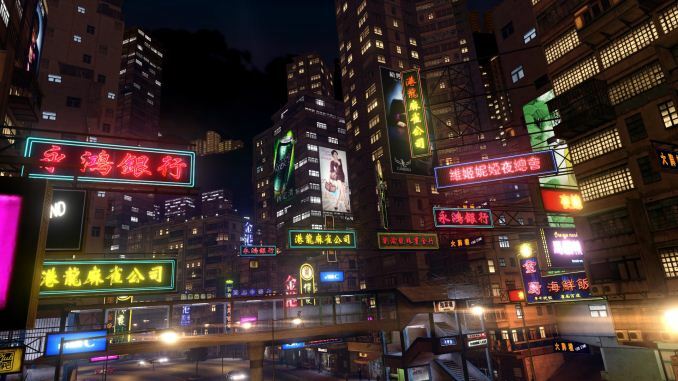 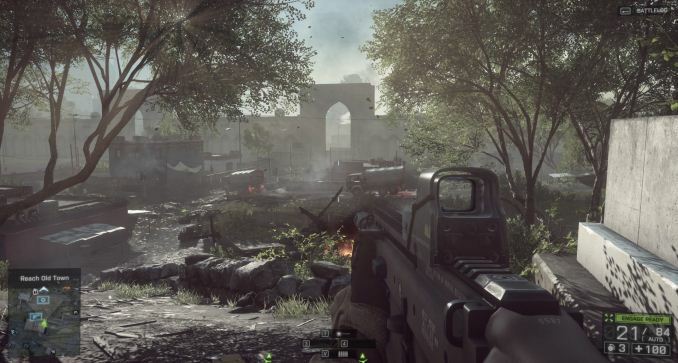 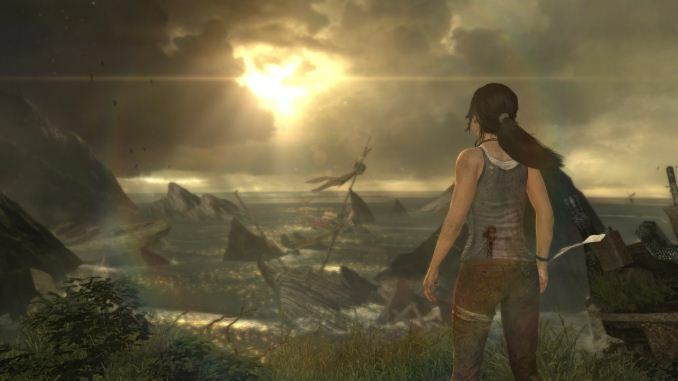 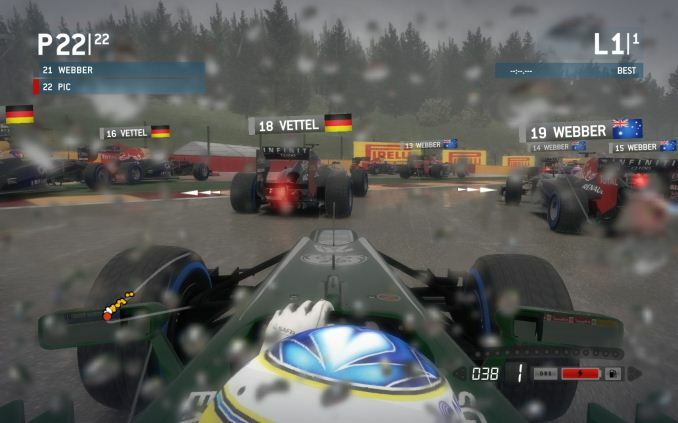 The variation might be more indicative of the benchmark as a whole, as it only takes one errant slow frame to produce a low result in the minimum FPS results.